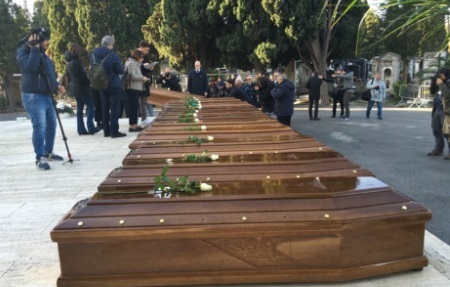 Twenty-six coffins were laid out in Salerno's Monumental Cemetery this morning, watched by a military guard, local politicians, rescue workers and journalists. A Catholic archbishop and a Muslim imam both said prayers. Each coffin bore a white rose on top, though only two were marked with names: Marian Shaka and Osato Osaro. The bodies will be buried in different cemeteries around Salerno. The city's mayor declared Friday a day of mourning. Local schools have been asked to hold a minute of silence, while light displays in the city centre will be switched off on Friday evening in remembrance. 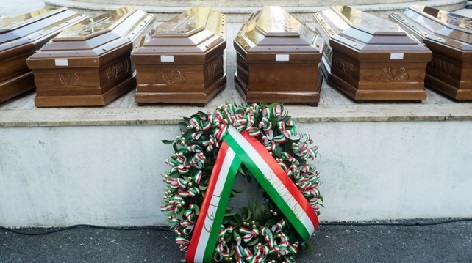 The girls' bodies were recovered at sea and brought to Italy on November 3rd. Post-mortem examinations revealed that 25 of the victims had drowned, while one had a wound to her side. All of the girls are believed to have been Nigerian nationals between 14 and 30 years old. Five have been identified so far. Two of them were pregnant, including Osaro with twins. Her coffin bore a pink and a blue rose in their memory. So sad. Is Nigeria even saying a word about this. REALLY REALLY SAD. To think they were all below 30 and were in search of a better life, even makes the tears flow more.